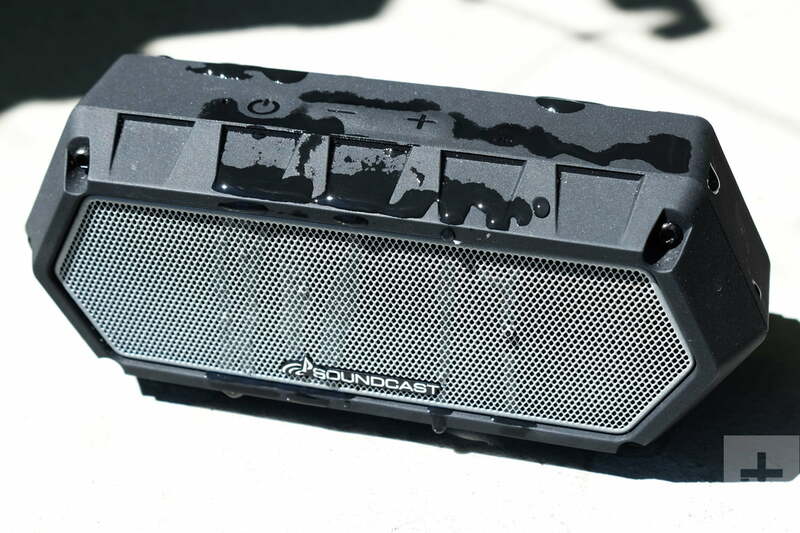 Soundcast’s miniature VG1 can get drenched and dropped, and still keep rocking. 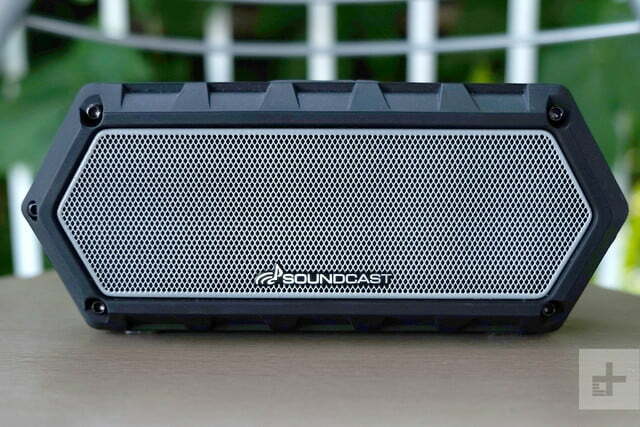 Soundcast’s new VG1 is the latest example of a tough-as-nails speaker that can take a licking and keep on streaming. Built to last from the brand that made its name on creating powerful (if pricey) outdoor speakers you can take anywhere, the VG1 has plenty of competition in the ever-expanding, ruggedized Bluetooth speaker market. Yet, despite its smaller stature, it also audibly punches above its weight for impressive sound in a diminutive package. In our Soundcast VG1 review we set out to discover whether or not the VG1 is tough enough to outlast the competition? Soundcast tries to illustrate the VG1’s versatility with some of the artwork on the box itself, but it’s an otherwise basic layout inside. The speaker itself comes with a 3.5mm Aux-In cable for wired playback, and a micro-USB cable for charging the battery. A pouch is included to save and transport the cables when not in use. 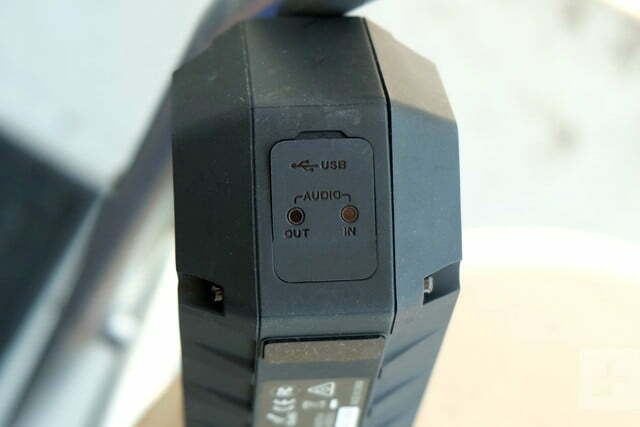 Soundcast also included a lanyard to latch onto the rail on the speaker’s left side. A quick start guide to get started rounds things out. Achieving an IP67 rating means the VG1 is capable of being submerged in water for up to 30 minutes at a one meter depth. That’s just the limit, but the point is that it will work just fine in the rain, at the pool (or even in the pool in short bursts), or around a tub. Even the beach is fine – a spot Soundcast’s speakers have long called home — so long as it doesn’t come into contact with saltwater. The salt and sand would get into every possible crevice. Being shockproof also doesn’t hurt. Soundcast built the VG1 to handle a tumble or two, evidenced by the rubberized body that envelops the speaker grilles on both sides. The dual-cone aluminum drivers are complemented by a passive bass radiator. With sound coming out of both sides, the VG1 is capable of spreading out a sound field at a decent radius around it’s meager profile. Soundcast built the VG1 to handle a tumble or two. The curves along the bottom make it possible to tilt the speaker on an angle, though we didn’t find much use for that. On top are playback controls, including keys for play/pause, volume, and Bluetooth pairing. 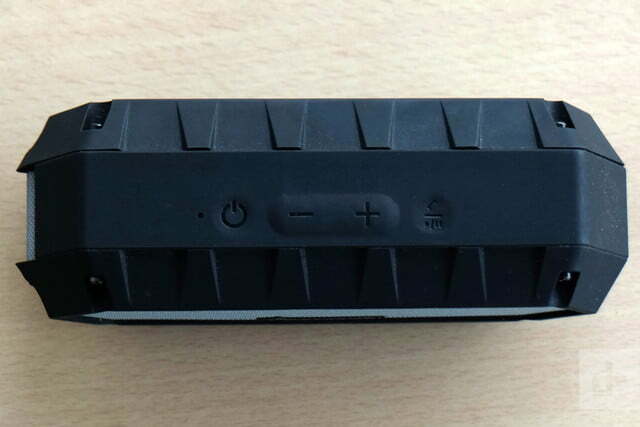 Conspicuously missing are track navigation buttons, meaning you can only skip or repeat a track on the playback device itself, though that’s something we see more and more on rugged speakers, which are often built with a minimalist ethos. Play/pause doubles as a phone button to take calls using the VG1’s speakerphone and mic. For iOS users, holding it down triggers Siri. 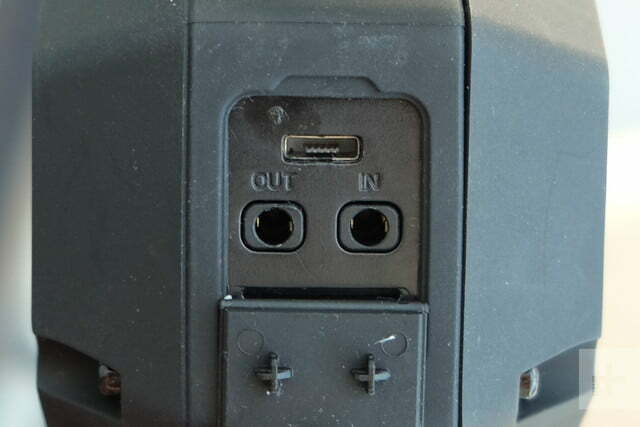 The speaker’s right side has a small housing with a micro-USB port and two Aux-In jacks. The reason for the second one is because multiple VG1s can be connected in a daisy-chain setup. It’s also possible to pair two VG1s wirelessly to create left and right channels for true stereo sound. Soundcast has kept things simple with this one neutral color scheme for the VG1, since no other styles are available. The VG1 packs an impressive level of balanced audio for its size. Usually, the concern when you go smaller is a lack of bass response, but Soundcast has managed to do pretty well here. We used the speaker often to catch up on daily news, while also watching documentaries and music videos on YouTube and Vevo, respectively, on a tablet at home. The speaker is able to get pretty loud, and we had an easy time covering most of a small condo while playing the content in the background. Like just about any portable speaker, however, the VG1 has a tipping point, and it’s an obvious one. Raising the volume incrementally, we noticed when distortion set in to muffle the low end. The more bass in an audio source, the more obvious the tipping point becomes. We played some old school funk to see how subtle bass guitar would sound. He’s the Greatest Dancer by Sister Sledge sounded warm, with the great guitar riff complemented by the modest low end in the track. Rick James’ Give it to Me Baby has deeper bass response, but the VG1 played it well at volumes well above the halfway point. It will work just fine in the rain, at the pool, or around the tub. To gauge vocals at louder volumes, we noticed Rag’n’Bone Man’s baritone in Human was the type of voice this speaker handles well. On the opposite end, higher octaves also came through well since the speaker doesn’t fully go off the rails in the midrange and treble registers. 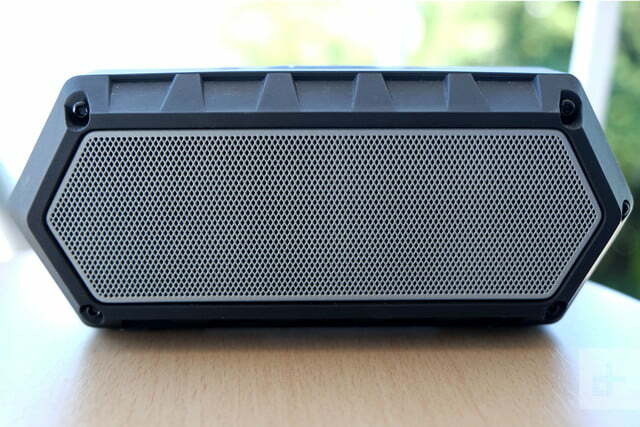 In any case, the VG1 handles music well enough to serenade and entertain, especially in outdoor settings. We played Luis Fonsi’s Despacito for a group of younger listeners, who were impressed at the quality coming out of the speaker’s size. We wouldn’t expect the same response from true audiophiles, but unlike some of the brand’s more pricey options, like the VG7 speaker, that’s not who Soundcast has tailored this for. The speaker does the best it can in more complex, multi-instrument recordings, though we did wish for more clarity there. The company rated battery life at 15 hours, but that’s only based on volume at halfway. The higher it goes, the more power it sips. We were able to routinely hit above 10 hours per charge, with an average of 12 hours at around 60-70 percent volume level. Soundcast offers a standard one-year warranty for the VG1, covering repair or replacement. The simplicity of the VG1 may be exactly what some people are looking for, offering a frame that is small and light enough to carry or travel with, without the risk of breaking down when the occasional mishap or weather phenomenon arises. The speaker is enticingly priced at $150, though Soundcast launched it at a time when a number of other manufacturers have similarly-priced speakers with comparable feature sets; without a standout feature or aesthetic, it’s a challenge for the VG1 to stand out in the crowd. The Fugoo Sport or Tough come to mind because they are among the loudest we’ve heard for their size. Because of the ‘jacket’ system they use, it’s possible to switch the outer casing from one to the other too. The Tough is $130 now, whereas the newer — yet less powerful — Fugoo Go is currently only $80. The UE Boom lineup also presents some excellent options. At $200, the Boom2 is more expensive, but it packs a big punch and comes in a variety of colors. The WonderBoom is a pretty compact $100 speaker that offers some of the same perks and even the ability to float, though it’s not as clear or powerful as the Boom2. Soundcast built the VG1 to withstand the rigors of the elements and slippery hands, so we’re pretty bullish on the external frame staying intact for a longer while. 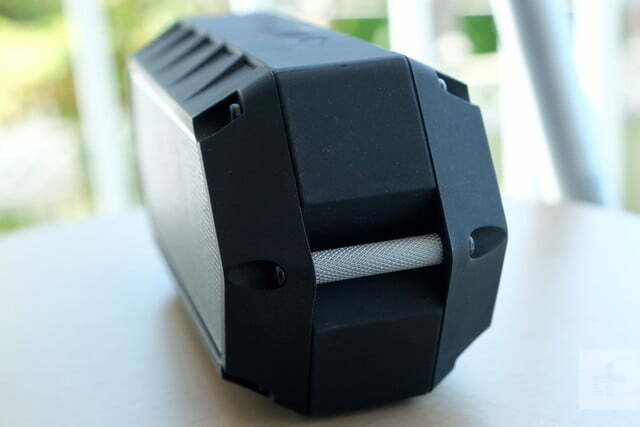 As long as you don’t continuously push the speaker to its distortive limit, it should be able to last a long time. Bluetooth connections are always hard to predict in the long run, but all should be fine there too. The speaker is easy to clean and rinse, so taking it outside repeatedly shouldn’t be a problem. If you want the ruggedness and like the neutrality pervading the VG1, then it’s a worthwhile buy. Competition is tight, but considering it’s simple to set up and use, and won’t break easily, it’s the kind of speaker that anyone can get a lot of use out of – even the kids.